I hooked with this story from the beginning, we meet Miri who is 15 years old and a Rain gatherer in the small village of Boreala. Boreala is a village set in a post apocalyptic world where most living things have died and in this story there are four tribes left. The world is too hot to sustain much growth and the skies have turned a shade of brown = the author has done an amazing job as creating this world where it is almost prehistoric in nature yet set in a future time – almost going full circle. Anyway back to Miri – the beginning of the book sees her and members of her tribe who are Rain gathered head out only to be confronted by Barbarians from another village called Stratos, on their way home. 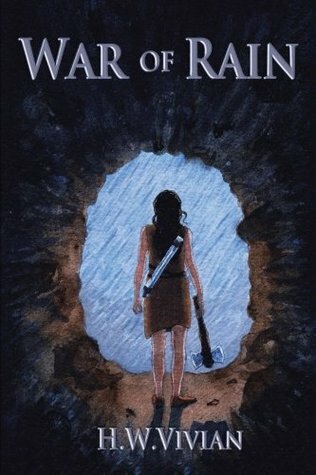 She makes the choice to save her tribe members and kills one of the barbarians which then has a knock on effect of a war starting between the two villages. The Chief of Stratos takes her hostage after destroying her village and tasks her with finding Kalona, the God of Rain to seek an intervention that will not only brings Peace but War as well. This truly was an amazing read, and following Miri’s journey through this strange world will just have you hooked. H.W. Vivian, like I say has done a brilliant job at creating this world and you are immediately drawn into the sights and sounds etc through Miri, I loved it!